JACKSONVILLE, Fla. - The second round of investigative hearings into the sinking of Jacksonville-based cargo ship El Faro began its second week on Monday. The ship sank Oct. 1 near the Bahamas en route to Puerto Rico during Hurricane Joaquin. A U.S. Coast Guard Marine Board of Investigation is looking into the ship's final voyage. Representatives with Herbert Engineering Corporation, the company that helped El Faro during its conversion from Alaska to the Puerto Rico trade in 2005 and 2006, testified Monday before the investigative panel. Rod Sullivan, a local maritime attorney, said the ship underwent modifications to make sure it could handle the new cargo plan. Sullivan said that with those modifications the company did an incline experiment and discovered El Faro had a permanent 2-degree list to the starboard side, which meant more cargo was loaded on the other side to compensate for the lean, so the ship would be on an even keel. Spencer Schilling, the president of Herbert engineering, believes the 2-degree list could have been caused during El Faro's time in Alaska where the loading ramps that the railroad trucks would drive up were located on the starboard side. The company also said that when El Faro was going through its conversion, the ship did go through a damage stability calculation. According to TOTE Maritime, the ship's owner, El Faro had a 15-degree list before it went down. Sullivan said that was most likely a combination of the ship taking on water and the wind speed causing the ship to lean. The standard measure for figuring out a ship's GM, which is the stability of the ship, is based on factors including the cargo loading plan, ship size and center of gravity. Due to El Faro's size, a wind pressure of about 50 to 55 knows, or 58 to 63 mph, was taken into account. So as long as El Faro didn't lean more than 14 degrees with a wind speed of 58 to 63 mph, it would have met the Coast Guard's minimum standard for stability in high winds. But when the Coast Guard asked if Herbert takes into hurricane force winds into account, like a Category 3 with 125 mile per hour winds for example, the company confirmed there were no calculations done to determine how far the El Faro would lean to the side. The Coast Guard does not require calculations for that wind speed. CargoMax, the software El Faro used to calculate ship stability and manage loading of cargo, also included a stability module that allowed captains to become familiar with the performance of their vessel under certain damage scenarios. "It's a way for him to go in and very quickly damage a few of the major compartments, get a sense for how his ship would survive and then he has that knowledge that he would get out of a deterministic approach. The tool is not meant to be used as the event is developing. We don't expect anyone to sit down at a computer when he's got a ship to take care of," Schilling said. Representatives with CargoMax testified Monday about some bugs and glitches that occurred while El Faro was using the software. But the production manager said the bugs did not have any effect on the software version that El Faro had. The ship master of El Yunque, one of El Faro's sister ships, is expected to testify Tuesday. Week 1 of the second round of hearings into the sinking of El Faro wrapped up Friday with the families of the crew in attendance as they were all week. 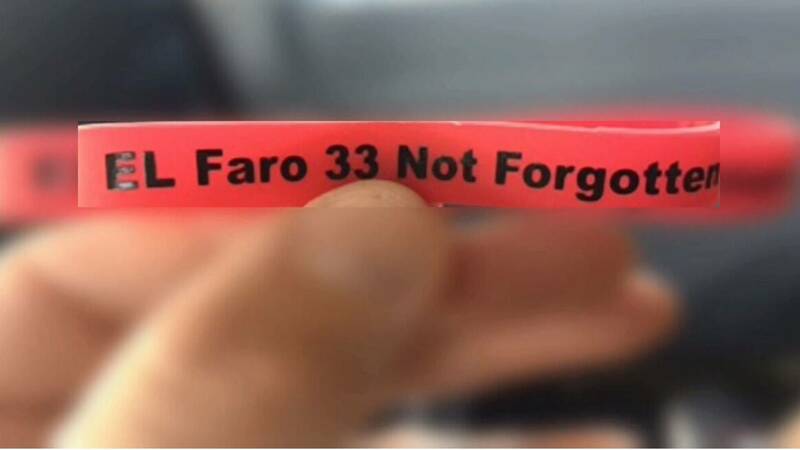 Pastor Robert Green, the father of LaShawn Rivera -- who died on El Faro -- handed out bracelets to people at the hearing Friday, saying it’s just one of the ways he and others want to support all 33 families involved in the incident, including holding grief sessions every fourth week. "There are some families that are at different places in their grief process, and some of them may have overcome that," said Green. "But there are still others that enjoy coming and have enjoyed being able to come together." Despite how technical the hearings have been at times, Green said the week was very insightful for him. "Even though my son sailed for 13 years, we knew very little about the conditions that he sailed under," Green said. An official with the American Bureau of Shipping, who inspects ships, testified before the panel Friday morning. The Coast Guard focused on a lot of what ABS knew and didn’t know relating to El Faro before the ship left Jacksonville in September. During the last round of hearings, work was described about getting El Faro ready for a move to Alaska for a new trade route. ABS said Friday it wasn’t aware of some of the changes. "ABS was not aware of any weight changes being made on El Faro in 2015, including the addition of fructose tanks," said Thomas Gruber, witness and former group head of loading and stability with ABS. "ABS is required to be notified of those changes so they can make updates to the cargo stability requirements of the ship." The added fructose tanks were less than 2 percent of the ship's weight, and according to TOTE, is not something they would have to report. "I would guess that TOTE made these tanks under 2 percent so they didn’t have to go through the process of recertifying stability and trim, said Sullivan. There were also issues with the scuttles on the ship. "Scuttles on the ship were required to be weather tight, not water tight. Because of that, it's possible that water can get into the hull of the ship, even if the scuttle is closed," said Gruber. "During the first two weeks of the incident, we got all of TOTE’s best witnesses when they said safety is always job one," said Sullivan. "Captain Hearn came in and said maybe that’s not the case. Sometimes they let safety slide in light of other concerns."